More on Mathematics – The Evolution of the Area Code | Passing Through . . . . 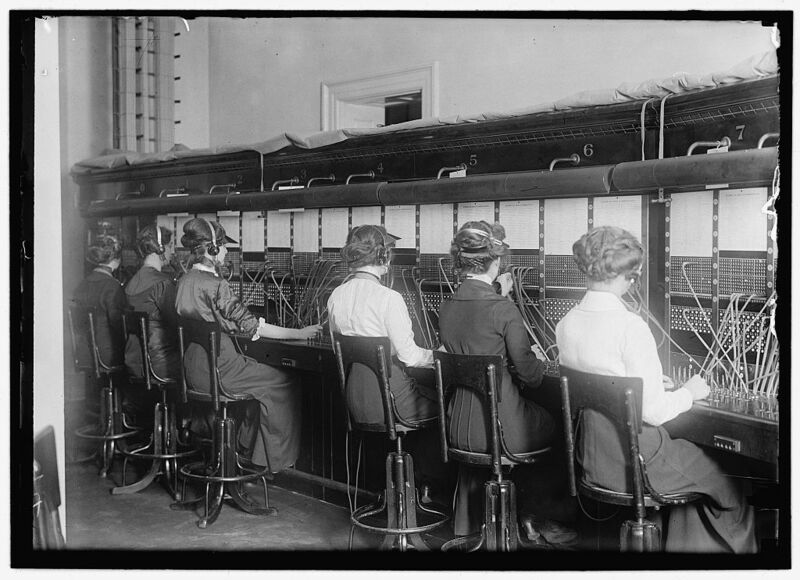 Automation, Bell concluded, would be the future of telephony. And “All-Number Calling”—no names, anymore, just digits—would be the way to get there. I want to tell you about the controversy the Bell System’s embrace of numeracy provoked—how resentful some people became when their familiar method of making phone calls was taken from them. I want to tell you about why the change was necessary, and how it still informs our conception of phone calls and text messages. I want to tell you about the future of the phone number. We’d owe that conversation, in some part, to the Bell System. And to the 10-digit coding system the telecom giant introduced to, and on behalf of, the American public half a century ago. Which brings us back to 1962. The North American Numbering Plan—the system of codes we still rely on, in augmented form, today—was a recognition of Parker’s argument. It was also, like so many other utilities we rely on for our everyday infrastructure, a corporate creation. They were also based on a particular type of hardware: rotary phones. To use those phones, you placed a finger in the hole of the number you intended to dial, then rotated the dial clockwise until you hit the phone’s finger stop. What this translated to, as far as the phone was concerned, was a series of clicks. Lower numbers on the phone, starting with 1, registered a lower number of clicks than the higher ones. What this translated to for the human user was less time required for dialing. The system Bell’s engineers devised married the hardware of the rotary phone to the machines that would provide the infrastructure for the nation’s expanding phone network. Computers, back then, were primitive. To ensure that area codes would be recognizable to the computers that were to translate the codes into geographical areas, the engineers created a system that placed either a 1 or a 0 as the second digit in each area code. (Those with 0 in the middle indicated states with only one area code—hence DC’s 202 and Florida’s 305—while those with a 1 denoted states with multiple codes.) The system meant that those early computers would be able to distinguish between a long-distance area code and a local number. Which meant in turn that they could route calls across the nation, to regions of the network and finally to local networks. When it came to creating the area codes for the country, the engineers also made their plans with maximum efficiencies in mind. New York, the most densely populated area of the nation, got 212—2-1-2 containing the lowest number of clicks possible on the rotary phone. Los Angeles got 213—the second-lowest—while Chicago got 312, and Detroit got 313. Anchorage, Alaska, on the other hand, got 907, which required 26 clicks from the person doing the dialing. To make the system even more efficient and human-confusion-proof, engineers also ensured that codes resembling each other (say, Oregon’s 503 and Florida’s 305) were distributed far apart from each other on the map. The Bell System’s new codes were first introduced to the public in the early 1950s, as part of a larger push toward automated, or Direct Distance, dialing. Bell, true to form—and recognizing the semi-audacity of its new numbering scheme—rolled them out in a way that will feel familiar to any current user of Facebook or Twitter: through beta testing. The company chose, as area codes’ introduction city, Englewood, N.J., which was conveniently located near Bell Labs and featured, as a bonus, switch equipment that was easily adapted to automation. And those lucky few who get to keep their sense of place get to gloat about it. New York’s 212 (as opposed to 917 and 718) is now a sought-after commodity; so is 415 (versus 510 for the East Bay and 925 for the East-East Bay). Pitbull brags about being not just “Mr. Worldwide,” but also “Mr. 305.” Vermont’s 802 code, for its part, has become a kind of regional meme. “Someone asked me recently if it’s a pot reference,” one seller of 802-branded t-shirts noted. John Manning is the Senior Director of NANPA at Neustar, overseeing the nation’s numbering system on behalf of the FCC and the rest of us. He spends a lot of time thinking about phones and phone numbers. He also spends a lot of time thinking about the future of telephony—which includes, of course, the Internet. “The Internet offers up a lot of opportunities, but it also opens up a lot of issues that aren’t necessarily there today,” Manning told me. There are, for one thing, security concerns to think about—ensuring that numbers dialed over VOIP, for example, get properly routed to their intended destinations. There are also resource concerns: As individuals, we’re getting, what with Skype and Google Voice and their many equivalents, more and more phone numbers. And the 10-digit numbering system currently in use throughout the U.S., Canada, and U.S. territories is, Manning points out, “a finite resource.” He doesn’t see that deci-digital system changing anytime soon: Like the Bell employees of the last century, Manning appreciates the power of user habit when it comes to our technological infrastructure. NANPA, he points out, takes pains to make transitions like area code splits and overlays as seamless as possible for those affected by them.